Submitted by Dan Dooré on Friday, May 25, 2018 - 12:47. The layout of the utility is exact to the Spectrum’s public domain Soundtracker utility, with the exception of a few additions to fit the Coupe’s huge requirements. The top half of the screen contains many functions which can be highlighted with a cursor bar. The right of the screen has a channel control, so you can switch on and off the 6 channels using the function keys. The bottom of the screen is gridded off into six boxes, where you can easily edit music. The six boxes relate to the 6 channels(!). First things first. After some looking over the instruction manual, we can try our luck on the Instrument editor. This is a wonder of modern music technology - instruments on E-Tracker (36 is the maximum) make up the music, and are made up themselves of 256 different elements per instrument. I won’t go into too much detail, but you can control noise, tone, pitch, noise frequency and stereo with this editor to better effect than the Sound Machine. Tips can be gained from the manual, and several demo music pieces which you can nick…erm, use creatively to your heart’s content. Simply, the letter is note “E”. It is a flat E, due to the presence of a - sign (smart arses will gather that E# is a sharpE and E on it’s own is normal E). The number after E is the octave number. Then, there is a brilliant combination of numbers for various functions. The numbers are Instrument, Ornament, Command and Value for that note. The first two are self-explainatory, but Command is a selection of commands you can use for the note (like echo and wave effects) and value is also used to manipulate the command. It delves much deeper in the manual. Cutting and Pasting, or Copying huge chunks of code is more-or-less straightforward (though you will need to consult the manual, though it is a great consolation that Sound Machine editing was trecharously difficult to the newcomer) and you can manipulate this chunk to your advantage. Once complete, your masterpiece can be saved for future use, or compacted in the Compiler, then saved. This Compiler is basically a space-saver, as well as a way to use the music in BASIC or Machine Code (same as Sound Machine!) with no hassle. The compiler has a 95% compression rate, which means in lay-mans terms that a 100K piece of music is squashed to 5K. It works on the principle of repeating pieces of music, so the Compiler may waver a little on this 95% rate, but not too much. In the beginning there was the Amiga, and an all-round good egg called Karsten Obarski. Being such a nice fellow, Karsten came up with Soundtracker. It was popular, to say the least, and was ripped off quite a bit. (Yikes.) 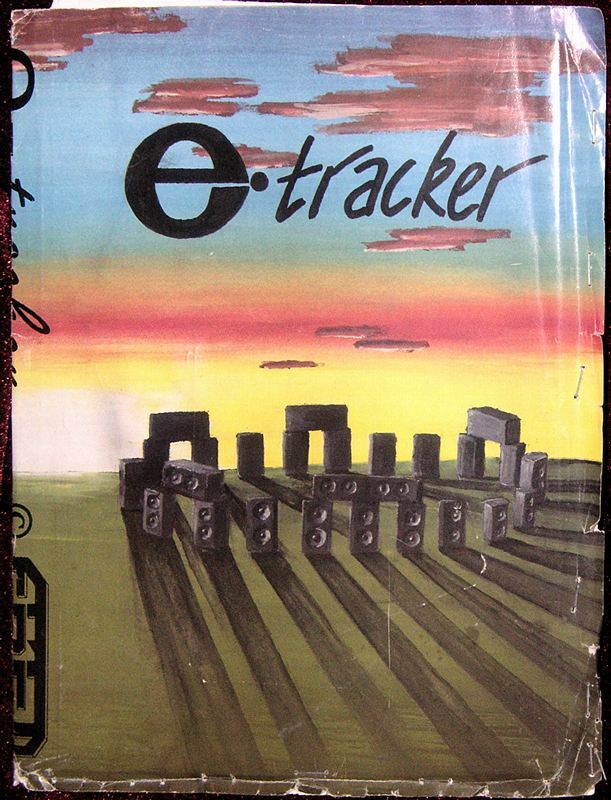 Then Mahoney and Kaktus did Noisetracker, Fairlight did Startrekker (ho ho) and various other people did their little bits to help the soundtracker concept evolve to its full potential, or something. One bright, crisp, Polish day, Search: “BZYK” decided to copy it to the Speccy, because all other music creation programs, especially Wham! The Music Box were complete crap. (Yea verily.) And, to put it frankly, the world of Spectrum demos was changed overnight. Well, obviously 'overnight' is a relative term. It probably was an overnight revelation if you happened to live within BZYK's postal district, thus ensuring your copy of the prog arrived within 24 hours. Programmers further afield had to wait a little longer, so perhaps it would be fairer to call it an 'over a variable amount of time' revelation. Yes. Sorry, where was I? The SAM has been crying out for a decent music package for ages, as far as I recall. Correct me if I'm wrong, but there's only been The Sound Machine and that made little more than a shallow dent in the huge lump of Silly Putty that forms the SAM user base. Let's hope that this one is received a little better. Okay, so on first glance it looks more like a freaky monitor than a music program, with its six windows displaying lots of pure hex. This is what has made the 'tracker family popular, believe it or not. Rather than traditional music notation, the whole caboodle is organised as a rather funky sequencer, and the hex gives you near total control over the entire soundchip. 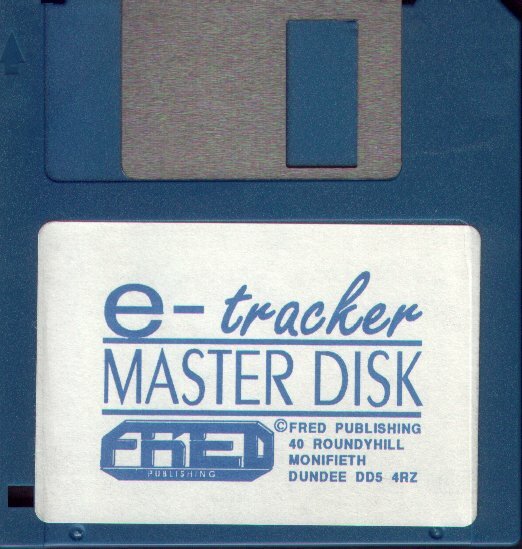 What distinguishes E-Tracker from the Speccy's dearly beloved Soundtracker is the fact that it's a piece of commercial software. (The original was PD and - shriek! - free.) However, this isn't as bad as it might sound to prospective owners, as you get the benefit of a well-written manual into the bargain. People who have used Speccy Soundtracker will be performing leaping handstands at this news, because the original came with, er, nothing. You had to figure out this immensely complicated program for yourself. Anyone who could actually do it qualified for tea with the Queen, or something, but now, thanks to the wonder of modern science and manuals and things, you can quite happily design instruments and trigger ornaments with little more than a GCSE in Maths. 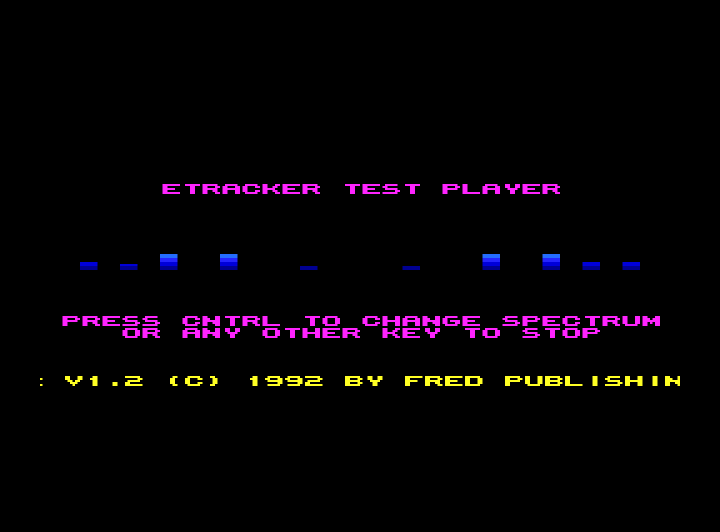 Of course, it would be pretty useless if you couldn't use the tunes you slaved over outside the program, so, just as with the Speccy Soundtracker, you get a compiler as well. Just write your song, squirt it through the compiler and you've got a standalone routine to call every frame. Hassle-free and fussless. 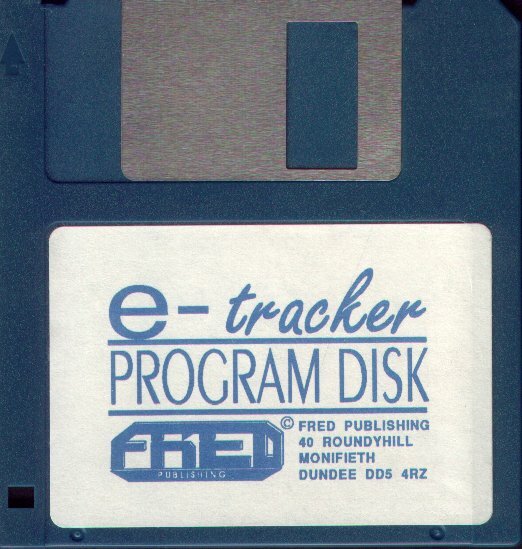 Now, I know E-Tracker will be a success. It's just right for really lazy demo coders, and I'm speaking from experience here. Six channels - eee, luxury. Bundled with the prog are a few useful bits and bobs: a nice conversion of Enola Gay by OMD and a token version of Axel F (with the obligatory wrong bit in the middle), several instruments and a warbling ornament. That little lot should set anybody off quite nicely, and before you know it you'll be tweaking the instruments and everything. Faults? I've found a few. The prog as a whole seems pretty well debugged (although I'm sure someone will be smugly pointing out something or other before the ink's dry on the issue) but the, er, classically-styled interface is a bit clunky. You have to scroll through all the options on a menu rather than being able to get to one straight away - glerp. Still, can't quibble over the results- all you need is talent, as they say. And a bit of patience. And lots of time. Er, and a SAM might be handy. Uppers: It's unique, and you get some great results from it. Oh, and it's got a manual. Downers: It costs quite a bit. Oh, and it's got a manual.